Make sure that all existing and new hire employees know what their responsibilities are and how to perform them with this sales manager job description. Oversee a group of account executives. 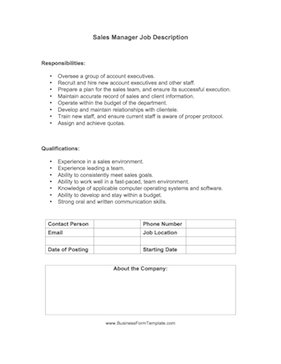 Recruit and hire new account executives and other staff. Prepare a plan for the sales team, and ensure its successful execution. Maintain accurate record of sales and client information. Operate within the budget of the department. Develop and maintain relationships with clientele. Train new staff, and ensure current staff is aware of proper protocol. Ability to develop and stay within a budget.